As usual, when I create a piece, I lay out the materials I think I'll be using and then the fun start. 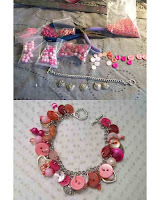 First I selected a variety of pink buttons and beads and put together the pink beads and buttons charm bracelet. These take me about 1 1/2 hours to put together, and I'm using jump rings between 6mm and 10mm, depending upon the size of the button. 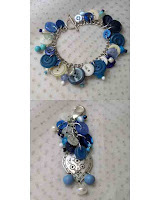 I was going to put it all away, but I just had to do another one, so I switched everything out to blue buttons and beads and made another bracelet. And, since I still had quite a few blue buttons laying out, pulled a silver heart out of found object s inventory, drilled a couple holes in the bottom for buttons and put together a Pull. I'm liking working with the buttons and I'm going to make an effort to incorporate them into more pieces.